So, it was time for desperate measures and I decided to move my blog to Github. Github has a really great feature called Github Pages. Github Pages is primarily intended to create static websites for projects you have in Github repositories. It also allows a website per Github user or organisation (http://<username>.github.io). For my blog I decided to have a Github Pages user website. The website is generated through Jekyll. This is a very straightforward static site generator built with Ruby and has good support for blogging. Don’t be fooled with the term ‘static site’. It certainly does not mean you have to write a full html page for each post. Jekyll uses the Liquid templating engine and with it you can break down an html page in reusable components (for head, header, footer, content etc). I used Visual Studio Code to create the html components. Now comes the part which I’m most content with (pun intended). Jekyll supports Markdown as the format for the blog posts. I so like this format because of it’s ease of use and minimalism. Since I didn’t choose one of the default Github Pages templates the blog looked very 90’s with only a plain Times New Roman font. That needed to change but I do like a very minimalistic style. My front-end skills are quite limited so I looked for a very simple responsive boilerplate framework to work with. I decided to go for Skeleton. Now the blog looks good again and writing posts has become much simpler and more fun for me. I have a local (and up-to-date) repository of the remote marcduiker.github.io repo. I copy the default blog post Markdown file and give it a proper name according to the Jekyll naming convention. I start editing the content of blog post file using MarkdownPad2. When I can’t finish the post in one go I save it in the _drafts folder. When I finish the post I save it in the _posts folder. All markdown files in this folder will be publicly visible. I commit & push the post (and relevant assets) to the remote repository. 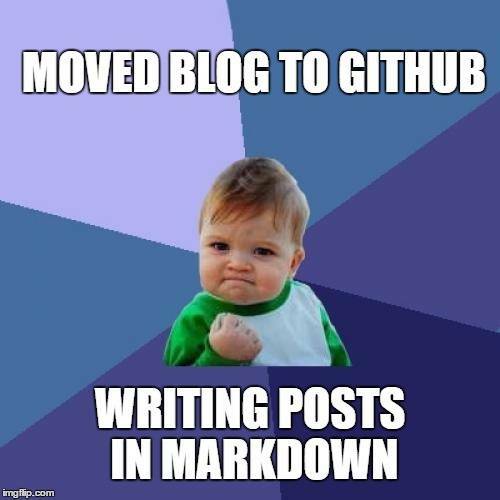 Note: I only use MarkdownPad2 for editing and previewing the blog post content. Because I’m not running Jekyll on my local machine I can’t see a fully rendered page before actually pushing it online. Since it’s so quick to make a change and seeing the rendered result online I’m fine with this approach. The workflow and tooling involved feel very natural if you’re a developer. I also like the idea of having my content in version control. So if you’re a developer who is either not blogging or want to switch to another blogging platform really have a look at Github Pages.